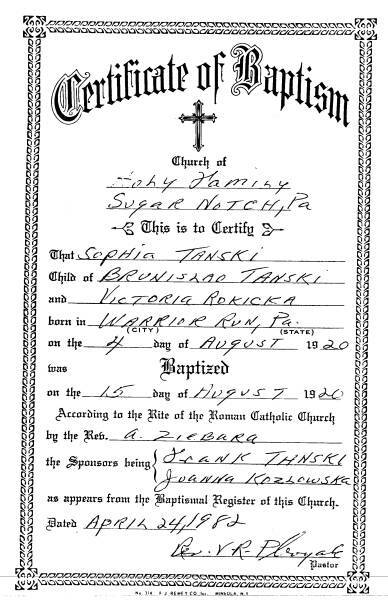 Sophia Mary Tanski (daughter of Bronislaw Tanski and Wiktoria Rokicka) was born on 4 August 1920 in Warrior Run, Luzerne County, Pennsylvania. She was christened on 15 August 1920 in Holy Family Church, Sugar Notch, Pennsylvania. In the 1930 census, Sophia was 10 years old. She was living with her parents and 4 siblings at 45 Stanley Street, Hanover Township, Pennsylvania. She was attending school. She lived at 97 Elizabeth Street, Wilkes-Barre, Pennsylvania from the time of her marriage in 1939 until 1989. After raising 5 children, she went to school to become a Licensed Practical Nurse. 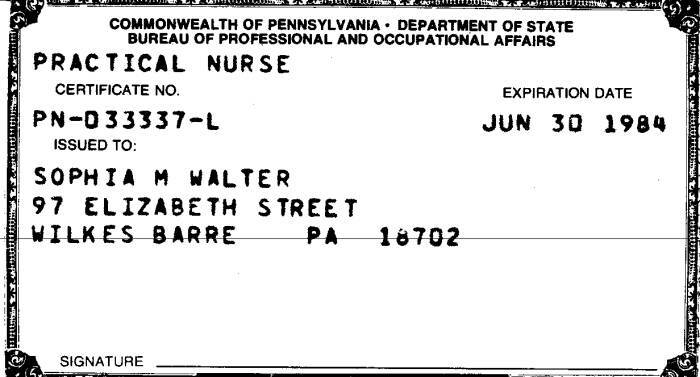 She worked at Valley Crest Nursing Home, Plains, Pennsylvania, until her retirement on 24 April 1983. In March 1989, when she required hip replacement surgery, she and her husband traveled to the Mayo Clinic in Rochester, Minnesota. At the time of her hip surgery, her husband needed heart surgery and also a hip replacement. They stayed with their daughter, in Rochester, until that summer, then moved to Farmingville, New York to live with their son Louis. On 20 December 1993, Sophia was admitted to University Hospital Stonybrook, New York for a routine cardiac catheterization and possible Angioplasty for Coronary Artery Disease. During the procedure on 21 December, she had a cardio-pulmonary arrest and was placed on a ventilator for a couple of hours before she died. She was buried on 24 December 1993, in St. Mary's Cemetery, Hanover Township, Pennsylvania. Sophia M. Walter, 73, of Elizabeth Street, Wilkes-Barre, died Tuesday at Stonybrook University Medical Center, Long Island, NY. Born in Warrior Run, August 4, 1920, she was the daughter of the late Bronislaw and Victoria Tanski. 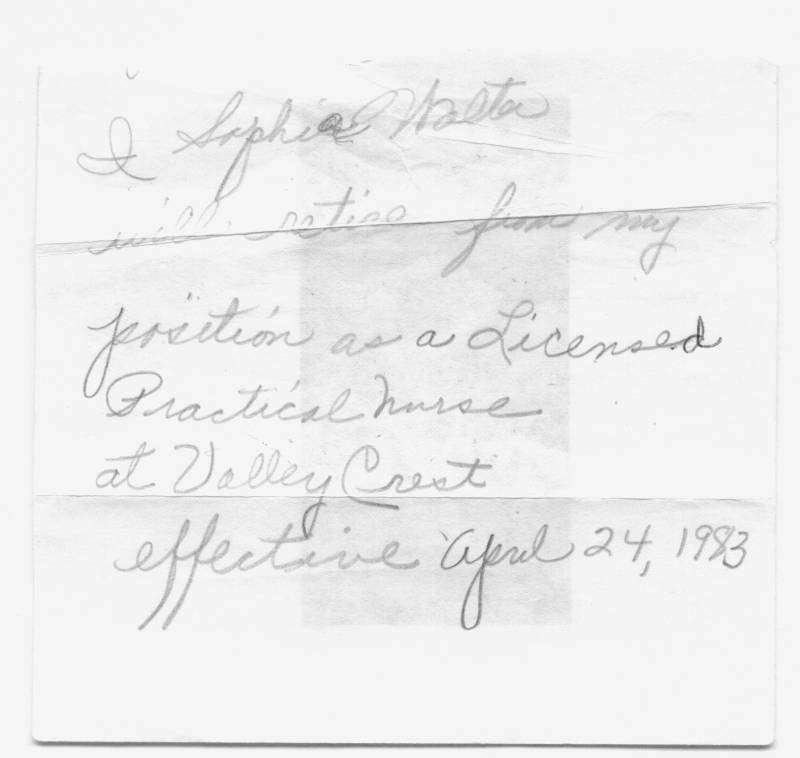 Prior to retiring in 1985, she was a licensed practical nurse at Valley Crest Nursing Home, Plains, for many years. She was a member of St. Nicholas Church, Wilkes-Barre. She was preceded in death by brothers Leo and Joseph; sister, Blanche Yurchak. Surviving are her husband, Frederick C. Walter; sons, Fred Jr., Mount Sinai, NY; John, Tucson, AZ; Robert, Langhorne, PA; Louis, Farmingville, NY; daughter, Mary Ann Koonrad, Lompoc, CA; 10 grandchildren; sister, Sabina Vance, Kings Park, NY; and several nieces and nephews. Funeral services will be at 9:30 a.m. Friday from the McLaughlin Funeral Service, 142 S. Washington St., Wilkes-Barre, with a funeral Mass at 10 a.m. in St. Nicholas Church. Interment will be in St. Mary's Cemetery, Hanover Township.